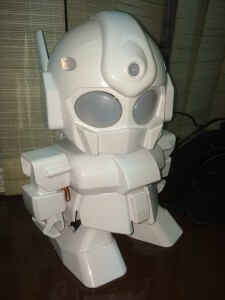 Rapiro is a cute, affordable, and easy to assemble humanoid robot kit. Rapiro comes with an Arduino compatible controller board, and you can reprogram Rapiro with Arduino IDE easily. One of the coolest feature is that you can extend Rapiro‘s functionality by connecting other components to enhance Rapiro’s capabilities. This time, I will show you how to control Rapiro with IOS devices through BLE connection. I will divide this tutorial in two parts. First will show you how to connect Rapiro to RedBearLab’s BLE Nano Board, and run a simple test code to confirm the connection. Then in the second part of tutorial, I will show you how to connect and turn your IOS devices into a remote control and to control Rapiro‘s action.